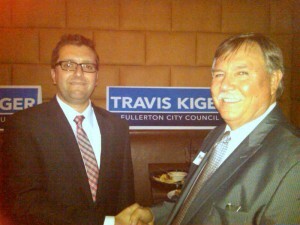 Fullerton City Council candidate Travis Kiger held a well-attended fundraiser yesterday at the Matador restaurant in Downtown Fullerton. As you can see, Councilman Bruce Whitaker seemed pretty happy about the prospect of getting some help on the Council. 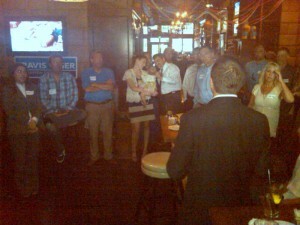 Travis spoke briefly about his goal of bringing conservative accountability to the Fullerton City Council. Was Bushala using his old Instamatic? Doesn’t anyone at FFFF have a decent camera? I took it off of the photo rotation because the blow-up version was scaring the kids. No, we should put it back, you and I write enough pro-Democrat stuff here, we need balance. I always keep a couple of Tony’s pieces up at the top for at least a few days. Plus, this Travis fellow is our webmaster – for free! I’ll see if one of the other photos looks better. There – that’ll never scare the kids – Travis and his little daughter Selah. My actual concern was that in that photo Whitaker looked — well, not like I’ll bet he appreciates appearing in public. (I didn’t want it to look like we were intentionally trying to embarrass him. I applied the same rule that I used to squelch a deliberately bad photo of Sharon QS.) The pic with Selah is much, much better. Why do you insist on perpetuating this hurtful and untrue allegation, even with your disingenuous disclaimer about Cletus? Whitaker put this canard to rest years ago. Cletus kilt ‘n et his own dog during the cold snap of ’05 when the crick froze over ‘n the still bust open. I believe you, I believe you, it’s just that …. it’s out there, you know. Hey, you’re going to like my next two stories, might even need a little of your input. First Five, and Royce. Good old Travis – a GREAT guy, and this blog’s invaluable WEBMASTER! Still I’ll be supporting the Dem in the race, Georgieff (from faroff HB) – I’m worried about a rightwing anti-labor majority in any OC town – but anyone’ll be an improvement over Doc Hee Haw!